Wool is absolutely essential to life, kind of like milk. …My own education regarding some of the unexpected benefits of wool came at the start of my career in soundart. I had created a collection of stories and sounds and wanted to present them in the IADT BA Fine Art Degree show. I needed to make a semi-sound-proofed area for displaying this work, so that it wouldn’t fill all the surrounding spaces, intruding on other artworks in the show. 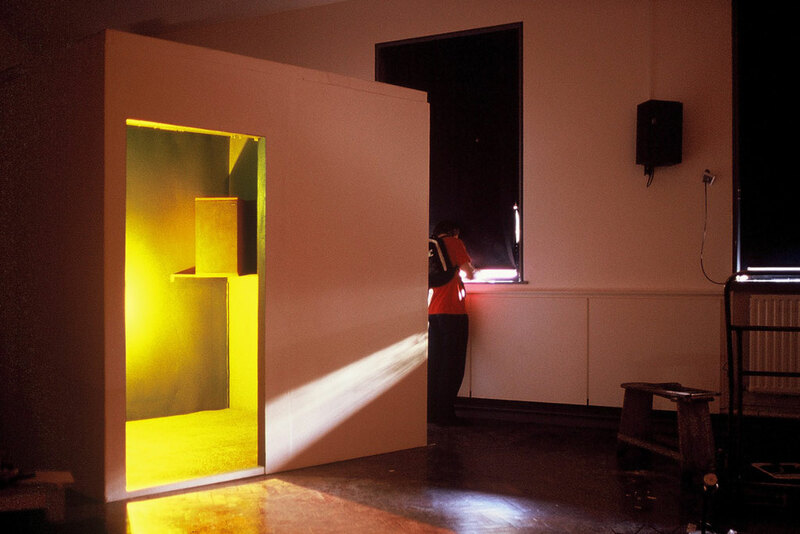 I spoke to my tutor – Geoffrey Perrin – and we agreed the answer was a walk-in box, muffled to the surrounding area with insulation material. Geoff was a wool enthusiast and encouraged me to use wool insulation. He said this would much nicer to work with than glass fibre insulation, and that it would create a lovely warm space. 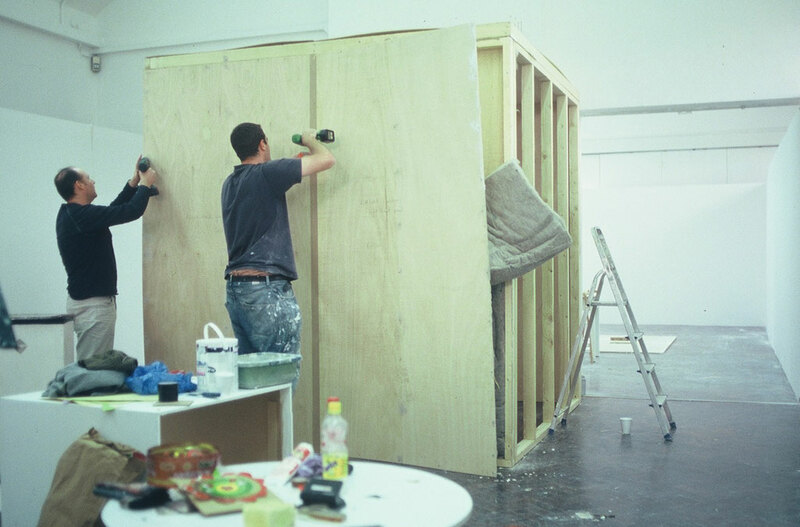 I did a pretty rudimentary plan for a box with a cavity for the insulation to fit into, then two talented carpenters I knew – Ned and Fearghal Leddy – spent a couple of days realising my design. Then I got some help from the technicians. You can see the thick wads of WOOL insulation material poking out between the bits of wood! 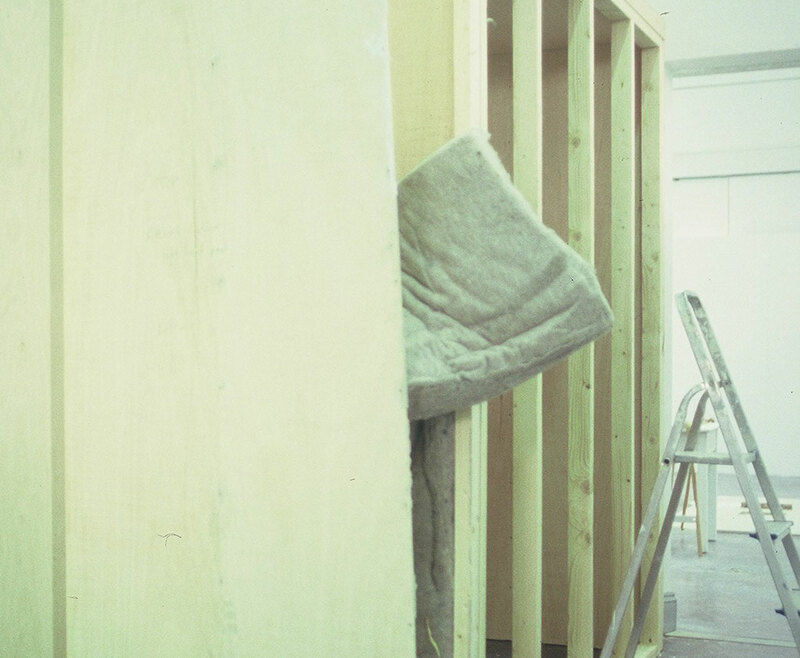 As we built the box, everyone commented on how lovely the wool insulation was to work with; how wonderful not to have to worry about getting cuts in your hands (as with glass fibre) or inhaling sharp fibres that might damage your lungs. Everyone fondled the insulation material as they came in and out of the room! 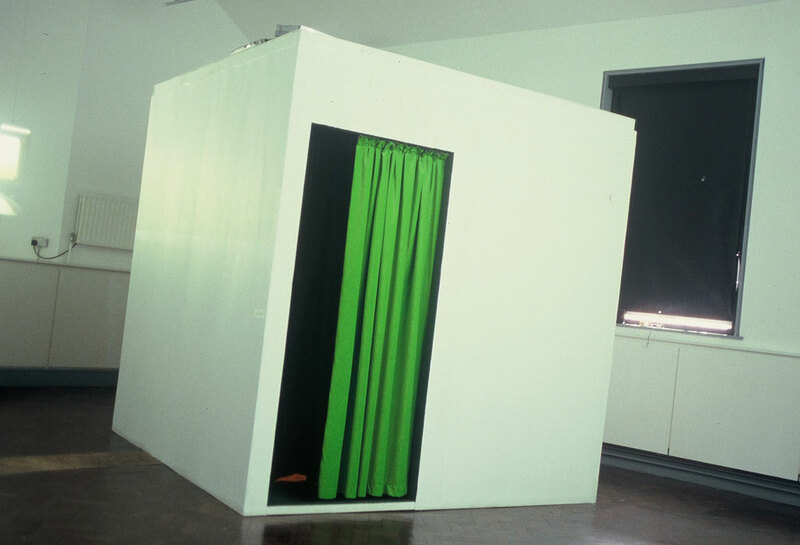 Once the insulated cavities were filled with wool, the outside of the box was clad and painted, and I sewed a violently green velvet curtain to hang over the entrance. It was an extremely dark – almost black – shade of green inside, and extremely, extremely warm. 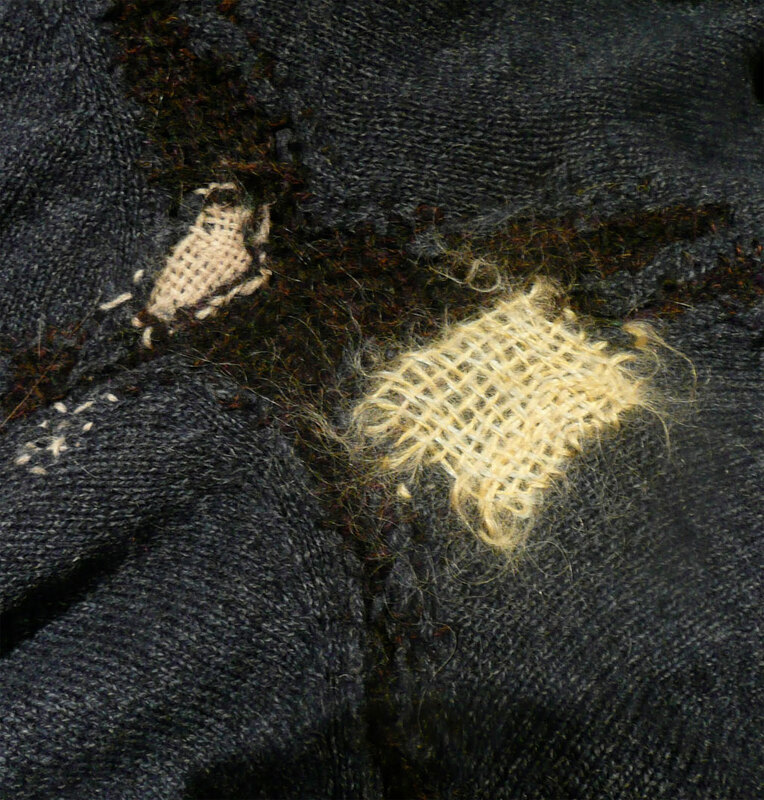 My inexperience with wool in my early twenties is so evident; I hadn’t really thought through the fact that the show was opening in JUNE, and with more than 2 people inside my giant music box, it became unbearably hot! 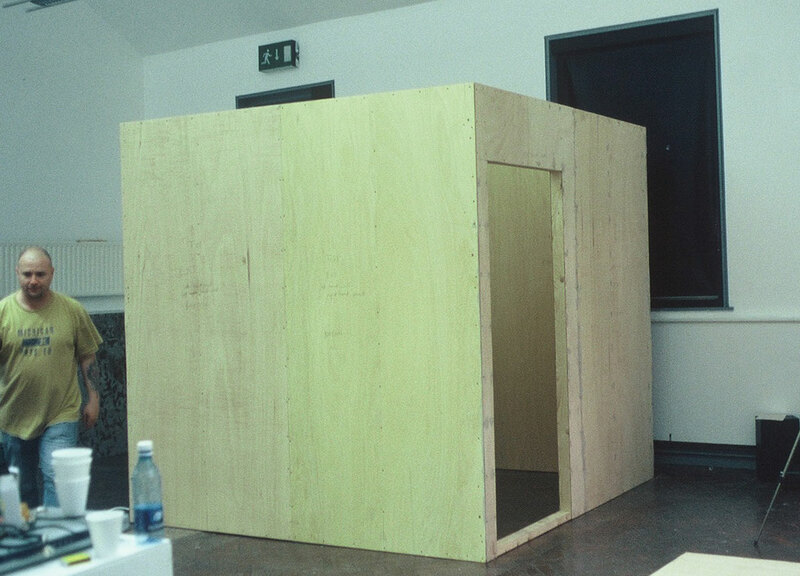 However the box was so well soundproofed that my tutor bought it off me with the plan of sawing it in half and turning it into a recording booth after I left the University. 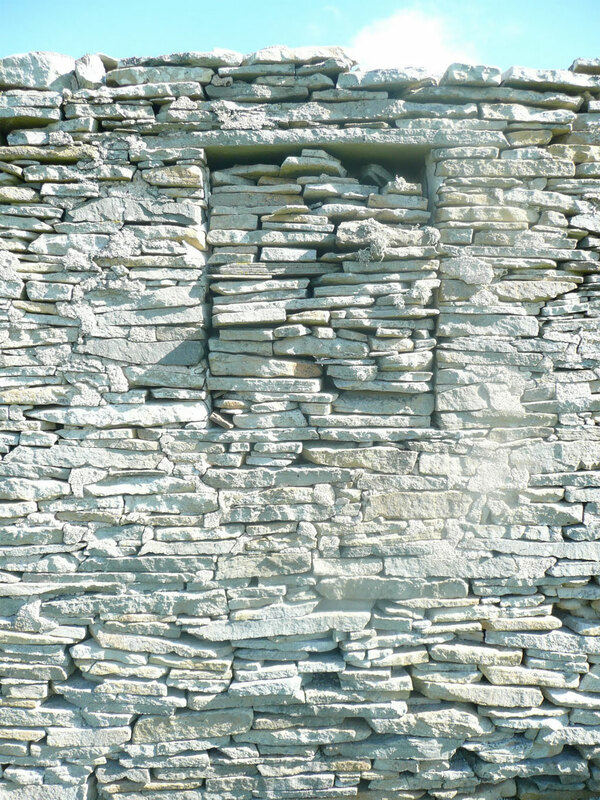 This early experience meant I was not at all surprised to find out more recently that other companies – most notably The Woolly Shepherd – are doing work that uses wool to improve the way some buildings sound. Many buildings – especially restaurants with a lot of chrome surfaces, high ceilings, open-plan design etc. – have a very echoey, difficult acoustic. This is because there is nothing to absorb the soundwaves, and so they bounce off all the surfaces making an almighty din! 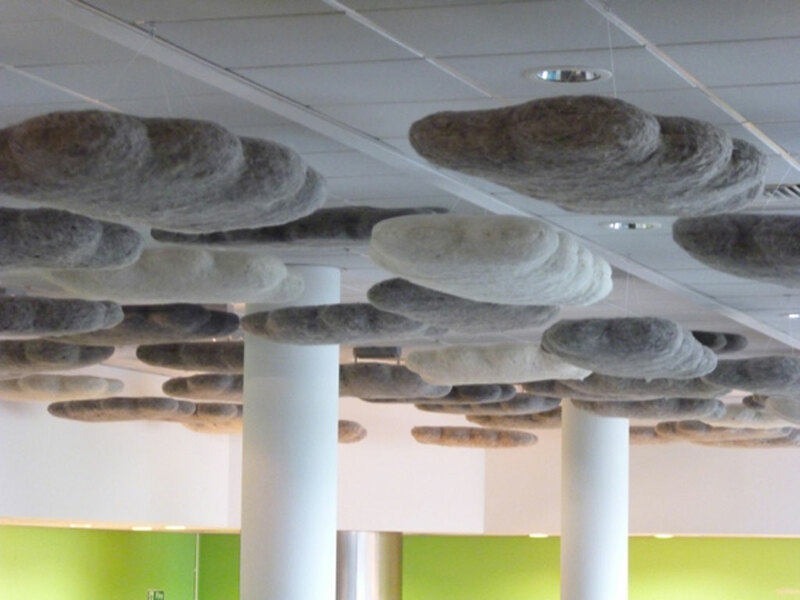 By placing ‘Acoustic Clouds’ into such spaces, The Woolly Shepherd has found a way of muffling the harshness of the acoustics; the wool fibres absorb sound waves which would otherwise bounce around for ages, making a racket. A simpler way of explaining how ‘Acoustic Clouds’ work is to say they reduce reverberation time, which is the official product description on The Woolly Shepherd website. You can read about the work of The Woolly Shepherd with their clouds, sound boards, and loudspeakers here. There’s also a video below which explains this acoustic work, and some of the other wonderful projects The Woolly Shepherd are working on with WOOL. What is interesting about the work of The Woolly Shepherd is that all of their projects utilise what is known as ‘waste wool’ because it is deemed too coarse for use in clothing. 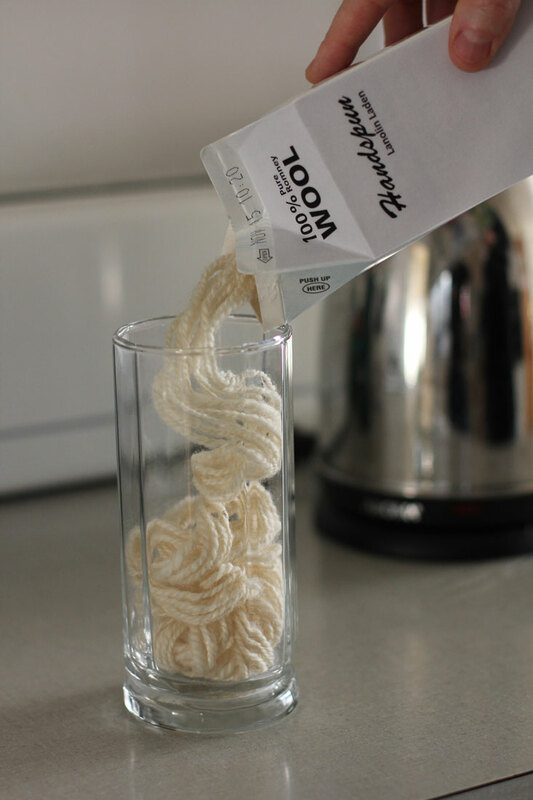 I like coarse wool for my clothes (within reason) but earlier this year I discovered a wool-based product for use in the garden which takes the coarse qualities of waste wool to new levels! The roughness of stronger wools that are sometimes the source of complaints in the textile industry becomes a massive advantage when you are trying to protect your delicate seedlings from hungry slugs! Later on today we have an interview with The Green Gardener, explaining just what I am on about here, but isn’t it great to learn that even the scratchiest types of wool can be useful? 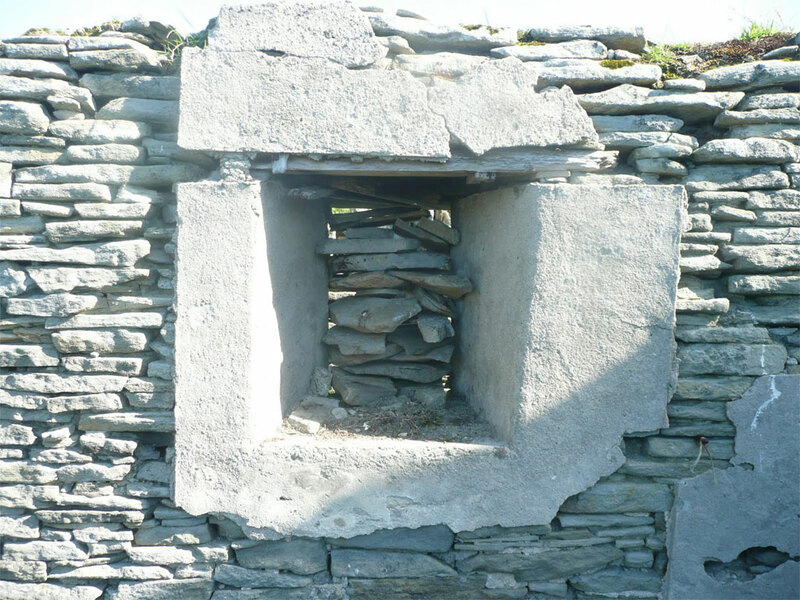 I can’t remember where I purchased my insulating wool from when I lived in Ireland, but my experience of using it leads me to believe that it has superlative powers for insulating houses. Black Mountain Insulation, Sheep Wool Insulation and Thermafleece are some of the sources for WOOL home insulation. I love all the Swaledales and North England Mules in this promotional video for Thermafleece! These examples for uses of WOOL in the home and the garden do highlight some of the extraordinary material properties of wool – breathability; insulating abilities; fire-retardant qualities – which make it an amazing (and safe) textile to wear. 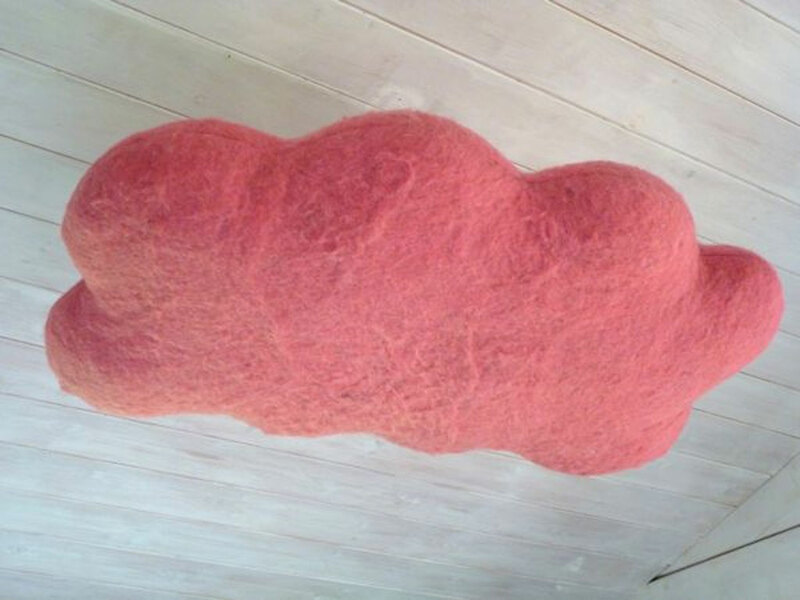 Best of all, the instances of WOOL usage for home and garden cited above are all better for the environment in terms of how they are produced and in terms of their product life-cycles – than their man-made alternatives. 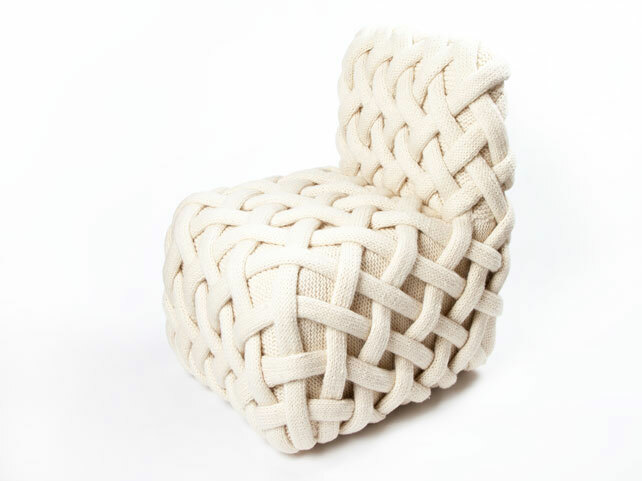 However uses of wool in the home and garden need not be purely practical, directed towards saving seedlings or energy; it’s also possible to introduce WOOL into the home via luxuriantly beautiful furniture, such as this chair created by Claire Anne O’Brien knitted using a bespoke yarn spun at Laxtons Mill and recalling the cabled, creamy fabric of many a treasured and comforting Aran sweater. What about this one, commissioned by Rowan Yarns for British Wool Week October 2010 and exhibited in Liberties window? As well as being made of British Wool and appearing to be comfortable to sit on, this grand chair with its exaggeratedly ‘knitted’ form exudes a throne-like authority. 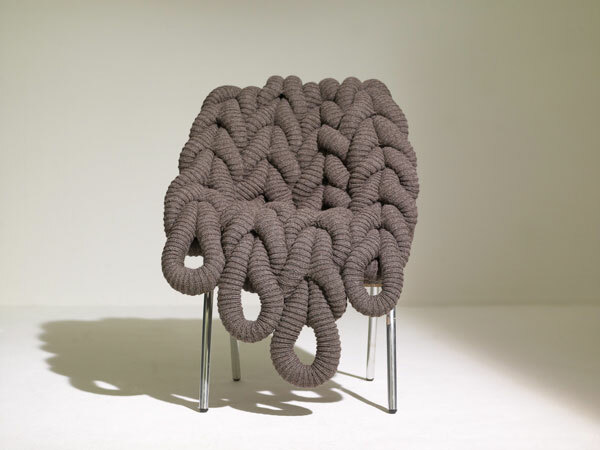 The grey wool composition recalls the monumental qualities of stone, and in the home a chair like this would be an amazing reminder each day of the power and presence of WOOL. Claire O’Brien is an artisan whose work is at once conceptual, useful, and exquisitely well-made. Working out of art and craft traditions simultaneously in the modern world has its roots to some degree in the Arts & Crafts Movement. This evening we shall hear from one artist especially interested in the WOOLLY doings of that movement’s most famous proponent – William Morris. 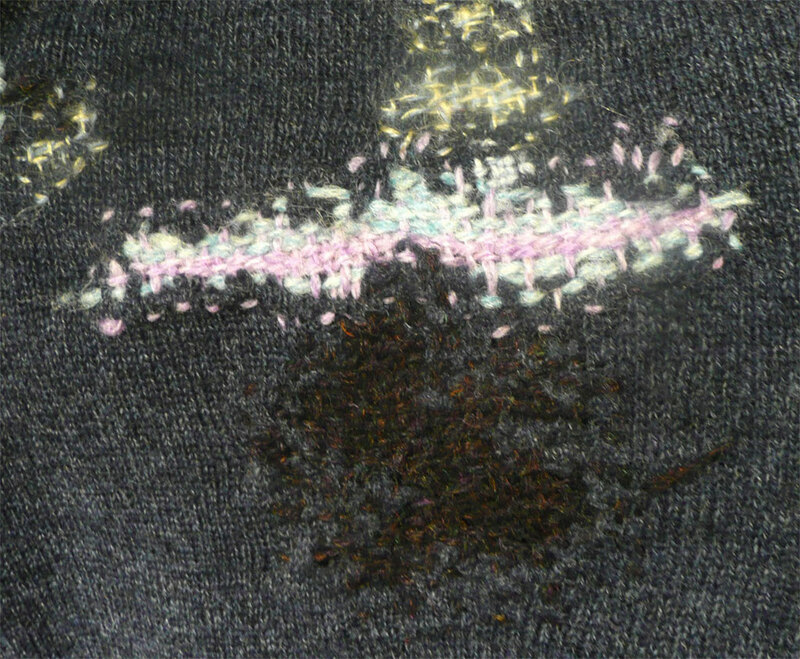 As we shall hear later, Kate Lynch’s natural dyeing activities are largely inspired by those of William Morris, who experimented with using plants to dye wool in the production of his distinctive tapestries and carpets. The things William Morris clothed Houses with at the start of the 1900s continue to be a source of inspiration and knowledge today. 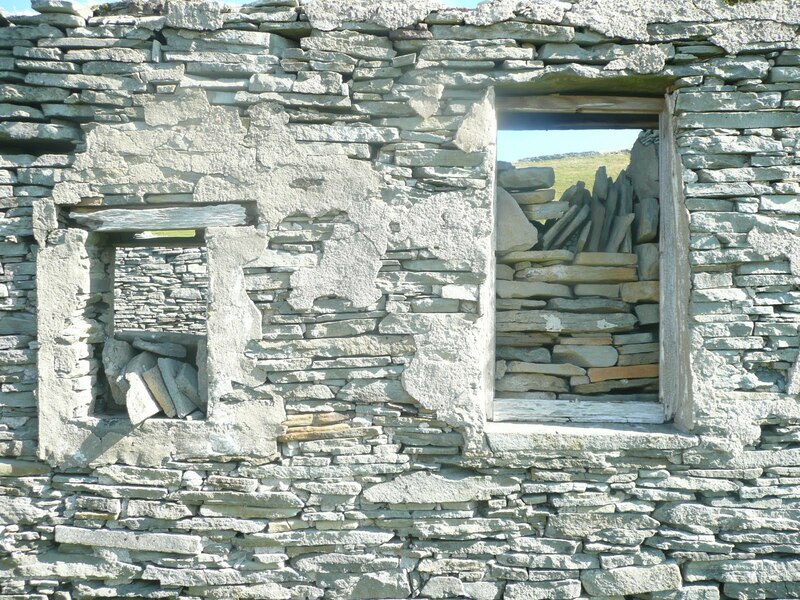 Filled windows in derelict croft cottages Bressay, Shetland. 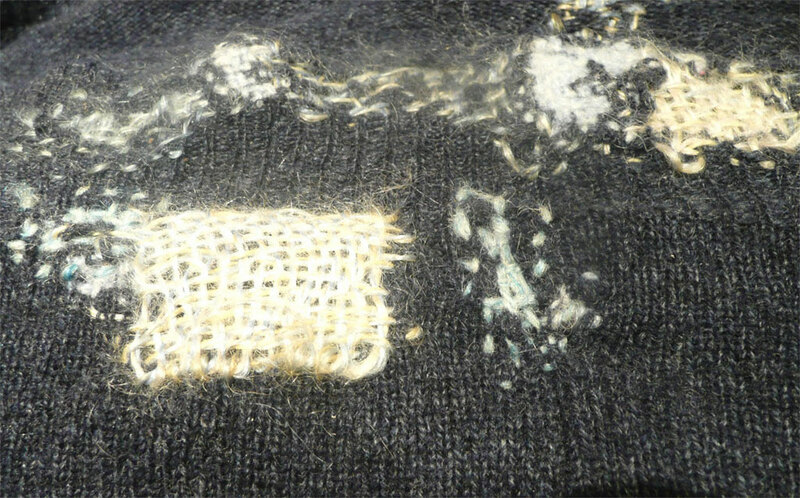 Blue Marks and Spencer jumper darned with Jamieson’s Spindrift £2.80/ 25g and Cecilia Hewitt’s hand spun, hand dyed kid mohair embroidery thread, £4.95/ 12m. We have begun a WOVEMBER Home & Garden Special Pinterest Board, as we are sure there are further utility/inspiration uses for WOOL in the home and the garden that we do not yet know about… help us expand the collection on our Pinterest board by leaving comments and helping us to find House & Garden items made of 100% WOOL. Couldn’t have said it better myself. If WOOL isn’t both useful and beautiful, then what is?